If you press-and-hold on non-editable text, such as an email or website, the word you tap on with be highlighted with beginning and ending arrows straddling the word and the pop-up menu will contain just a single "Copy" option. You can drag the arrows to include more text, and if you need to scroll the screen you can lift your finger, drag up or down to scroll, and then contine to highlight more text. This may give you mixed results where it doesn't allow you to select more text or it deselects what you already highlighted, but just try doing it again or doing it in stages. 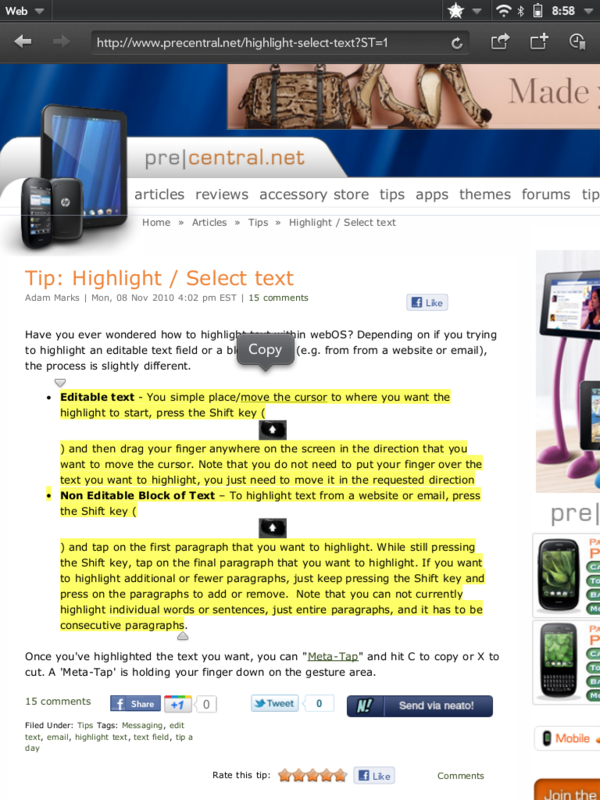 As a good tip, you should always start with the first word that you want to highlight since it can be tough to get webOS to highlight those first few characters. Once you have the requested text selected, tap the "Copy" pop-up to copy the information to the clipboard. For editable text, such as an email draft or Memo, press-and-holding on text will not automatically select text, but rather give you an option to Select, Select All, or Paste. Tapping Select will select the one word, and then follow the steps above for non-editable text to select additional text. Select All will select all selectable text on the page. As you continue to select you text, a pop-up will continue to appear that will now be changed to Copy, Cut or Paste. Copy and Cut will both copy the data to the clipboard, with Cut also also deleting it from the text. Once you have data copied to the system clipboard, you will then need to paste the data into an email, website, application, etc. Just as above, you just need to press-and-hold on an editable text field to get a pop-up with a Paste Option and just tap Paste. If you are unable to get the pop-up, two tricks to try are to either press-and-hold exactly where the text cursor is, or to type some random text, press-and-hold on that text to select it and then choose "Paste" to paste on top of that random text.